The tender rhyming lyrics of Deborah Lee Rose's lullaby book were put to music by Grammy Award winner Tom Chapin, the “pied piper of children’s music.” The story follows a mother and child through their loving nightly ritual. 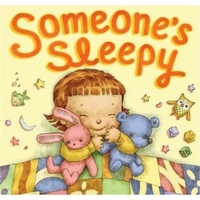 This song accompanies the storybook “Someone’s Sleepy” by Deborah Lee Rose, illustrated by Dan Andreasen. Published in 2013 by Abrams Books for Young Readers, an imprint of ABRAMS.